Purpose: Use this document as a reference for making interim deposits in ctcLink. Enter the Business Unit and Cashier’s Office and click the Add button. Enter the type of Tender removed from the drawer. 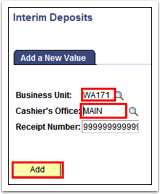 In the Item Amount field, enter a negative value for the amount of tender being removed from the drawer. Click the Create Receipt button. There may be a message that the drawer total will fall below the minimum amount. This is a warning and not an error. Click the OK button. The Create Receipt button becomes the Print Receipt button; click the Print Receipt button. Click the OK button.